Hasbro and the Hub Network are bringing families giant-sized versions of their favorite board games where they have fun playing with each other and against other families for a third season of “Family Game Night” hosted by Daytime Emmy Award winning host Todd Newton who won the Emmy for this very show. Newton is the former host of “Whammy! The All New Press You Luck”, “Lingo” and many other games shows in which some he was the announcer for. Newton is a host’s host. He is a host who is actually well-known for hosting, and not for something else before taking-on a game show. Some examples of this are: Nick Lachey (The Sing Off, The Winner Is) of “98 Degrees”, actress Jane Lynch (Hollywood Game Night), and Steve Harvey, best known as a comedian before hosting “Family Feud”. In an earlier interview, he stated that he always wanted to be a game show host early-on in his career. EXCLUSIVE interview with Todd Newton – A Life of Games! It’s Newton’s job as host of “Family Game Night” to facilitate the families in their game show playing experience, making it a memorable one, and genuinely being excited for them. There are some new games to get excited about this season, as well as some familiar ones that are returning this season. Fans will be glad to know that the returning games are: Connect 4; Basketball; Simon Flash; Sorry! ; Operation; Bop It!, and the new one last season Battleship will also be back. The new games that will have families in friendly competition for a chance to win cash, prizes and a new car this season are: Jenga; Barrel of Monkeys; Monopoly Remix; and a re-invented Yahtzee. This season, “Yahtzee” is played in two rounds by one family. FAMILY GAME NIGHT: You Sunk My Battleship! 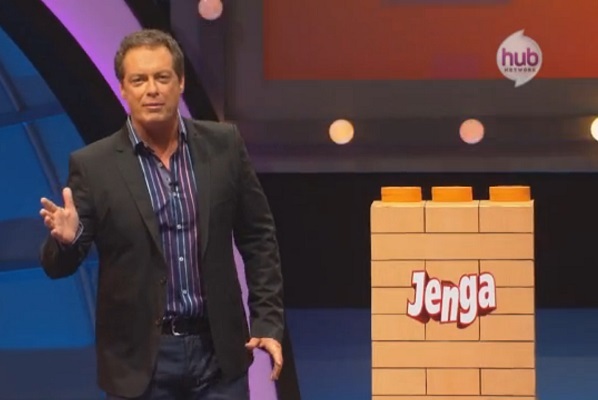 Newton also picked “Jenga” as his favorite game this season. He said, “Reason being is it’s big, loud, and exciting.” An old game Yahtzee has was re-done this season to reflect on the audiences taste according to Newton who said that the production caught onto what would appeal to more people in a different form. It’s why’s they changed it. “Family Game Night” makes it’s return on Sunday, August 18, at 7pm on the Hub Network.